A garden should have an element of mystery. You should never be able to look at a garden in two minutes flat and walk away. There should be perspective, where you find it disappearing and yet when you look around, you find an element of surprise. 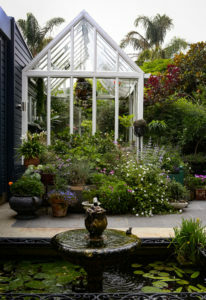 So says Malcolm Hayward whose home is part of the Heroic Garden Festival tour on February 16 and 17 that features 28 diverse gardens across Auckland with six of them in east Auckland. Malcolm says the property was a dumping site for building material debris when he bought the Bucklands Beach home in 2012. 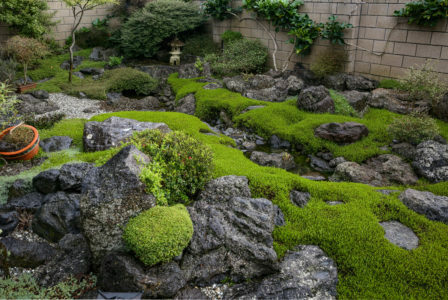 He started renovating and landscaping and has now been magically transformed into a Japanese-style courtyard garden. A pathway lined with espaliered (trained to grow in a certain way) fruit and vegetable trees leads up to the spacious porch at the rear end of the house, overlooking an English meandering garden, with traces of Italian design. 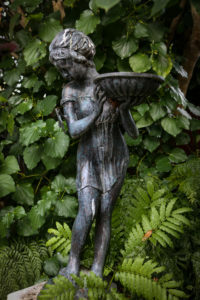 Sitting proud in the centre of the courtyard is a formal water fountain that houses water plants, lilies and fish that have happily made the pond their home. Malcolm, who converted a small cottage garden into a picture-perfect outdoor space, says that as well as the artistry, colour and texture, perspective is important in every garden. Talking about the Japanese garden, he says he had a eureka moment when he decided to plant native New Zealand plants in a Japanese courtyard with a pond and fish. The idea worked perfectly and now he finds himself every morning enjoying the play of light as he has his morning cup of coffee. 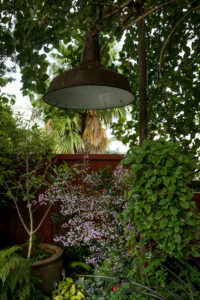 “The Japanese courtyard-style garden with its structure and serenity creates a different room in the garden,” he says. The European style back yard is a perfect place for a garden party. It’s a cool retreat with plenty of different points of interest and more than 100 shades of green, a perfect contrast to the garden in the front. An English statue surrounded by a burst of green, overlooks a glasshouse. As you step in the eclectic green space, there are aquariums with tropical fish and wind-sensitive plants that grab your attention. A frangipani plant towers above with its sweet, scented flowers. The beautifully landscaped garden looks like an art canvas when the sun goes down and the mood lighting brings a warm glow to the garden filled with perennials, exotic flowing plants, rambling vines and manicured shrubs. As part of the Heroic Garden Festival, Malcolm is happy to share his garden with strangers. “I don’t mind opening my house up to keen gardeners since it is all for a good cause with the proceeds donated to Mercy Hospice,” he says. The Heroic Garden Festival is in its 23rd and final year. There is an option of a fully catered bus tour experience of the festival gardens on Sunday February 17 hosted by Tony Murrell.